The Solar Gators is a student design team at the University of Florida that aims to raise awareness of the power of renewable energy by designing and building a solar-powered race car from scratch. The team, which is composed of mostly engineering students, takes part in the annual Formula Sun Grand Prix (FSGP) competition against other collegiate solar car teams from around the country. The competition consists of a track race, according to Solar Gators member, second year electrical engineering major, Stephen Thomas. “The goal of the race is endurance, so the most miles in a specific allotted amount of time,” Thomas said. The current Solar Gators are a relatively new team, forming just two years ago and has built two cars in that time. While a large chunk of their budget comes from the Department of Mechanical and Aerospace Engineering, a lot of their car components are donated to them by various companies that work with them and teach the members new ways to improve their cars. 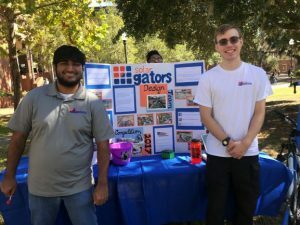 Students looking to get involved with Solar Gators should visit their Facebook page or their website at https://www.ufsolargators.org/. They hold weekly meetings on Mondays and Thursdays at 6 p.m., typically in Matherly Hall. Intro to Bicycle Maintenance – Nov. 7 & 14!